Hello and welcome. 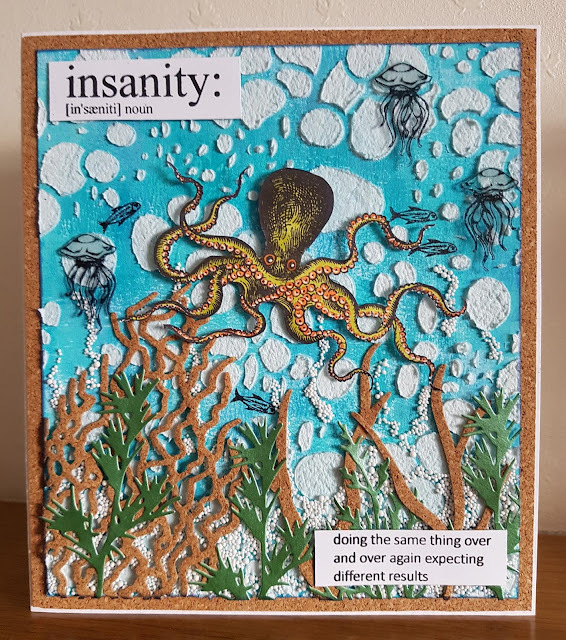 I just love a sea theme and this octopus from Tim Holtz Sea Life is just fabulous. 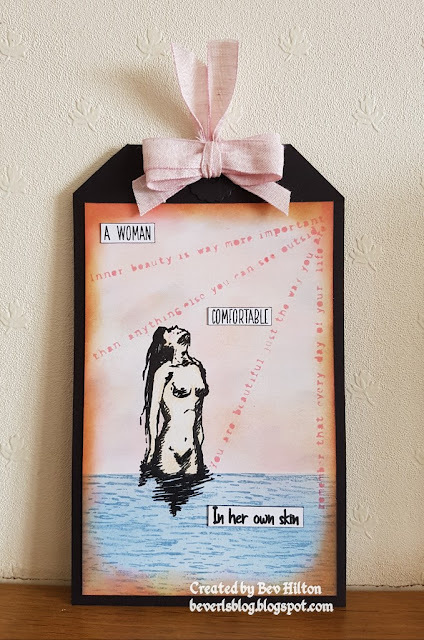 With the weather still being so warm and sunny and my dog still enjoying a good swim in the sea I thought I would make something with a summery feel. Tim Holtz stamp set...Sea Life. Studio Light stamp set...Summer at the Beach. The Crafters Workshop Stencil...12 x 12 Cell Theory. PaperArtsy fresco finish chalk paints...Carribean Sea, South Pacific, Blue Glass and Snowflake. Cadence Mixed Media Artsy Stones...Small. Sheena Douglass Die...What a Mesh. Sizzix Thinlits Die...Holiday Greens and Branches. Breyer over a piece of smooth white card with the fresco paint until happy. Lay the stencil over the card and push through the Fibre Paste. Set this aside to dry. Take a spare piece of card and stamp the octopus in black ink. Colour with the brush markers. Use the signo pen to add some highlights. Take a piece of acetate and the stamping platform and stamp the small octopus three times using black stazon ink. Cut out carefully. Take the cork sheet and die cut the mesh and Branches. Die cut one of the elements from the holiday greens that looks like seaweed from the green card. Now the Fibre Paste is dry, take the cosmic shimmer glue and drizzle it up from the bottom of the card and then sprinkle over the art stones. Once dry, glue on all the weed and then glue on the octopus using glue gel. Glue on the jelly fish using glossy accents. Carefully stamp the small fish a few times with black ink. Take a piece of smooth white card and stamp the wording. Cut apart and glue one part in the top left and the other part in the bottom right. Mount the finished piece onto a sheet of cork and then onto your finished card base. I do hope you like it and thank you for dropping by. Have a super weekend and hope to see you again soon. Really love this Bev, amazing detail and texture.